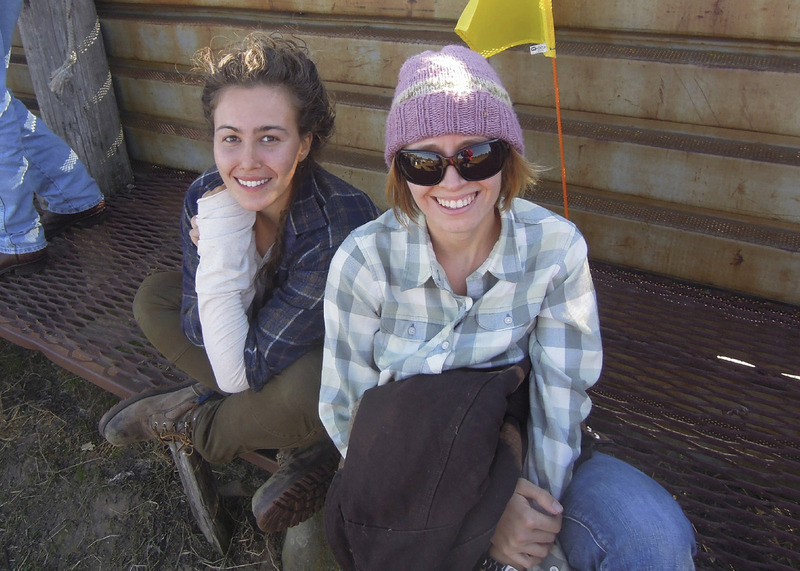 Guest Post by Eliza Perry, one of our Hubbard Fellows. All photos are by Eliza. Anne and I have been spending a lot of time with bison over the last four weeks, something neither of us ever thought we’d do. First, we went four hours northwest to TNC’s Niobrara Valley Preserve, our largest property in the state and home to two herds of bison. 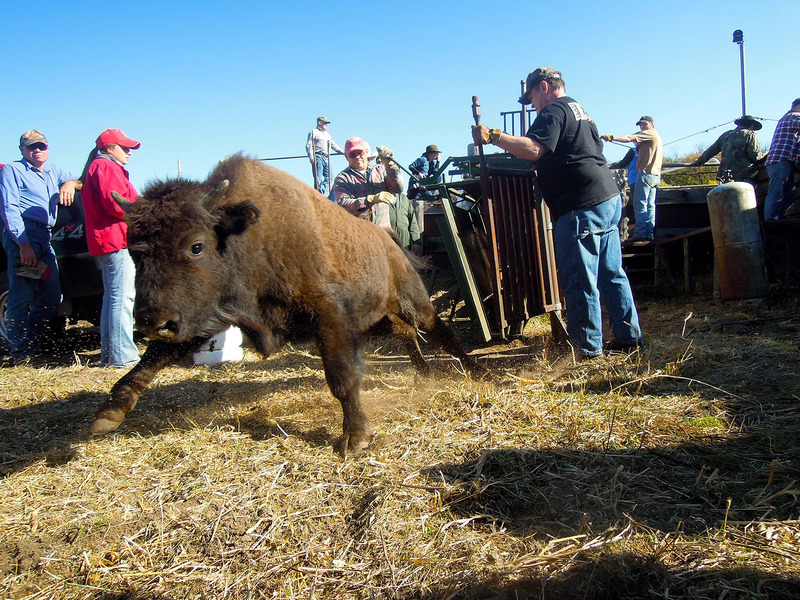 We were there to help with the roundup of the east bison herd. I didn’t grow up around livestock, so this event was really thrilling for me. Because they are herd animals, bison can get very aggressive just by being separated from the pack, leading to a lot of banging and even some blood. Corrals are designed to safely and efficiently move livestock to minimize their stress. The hope is that the less time they spend inside the corral, the less stressed and agitated they will become and the fewer injuries they will sustain. 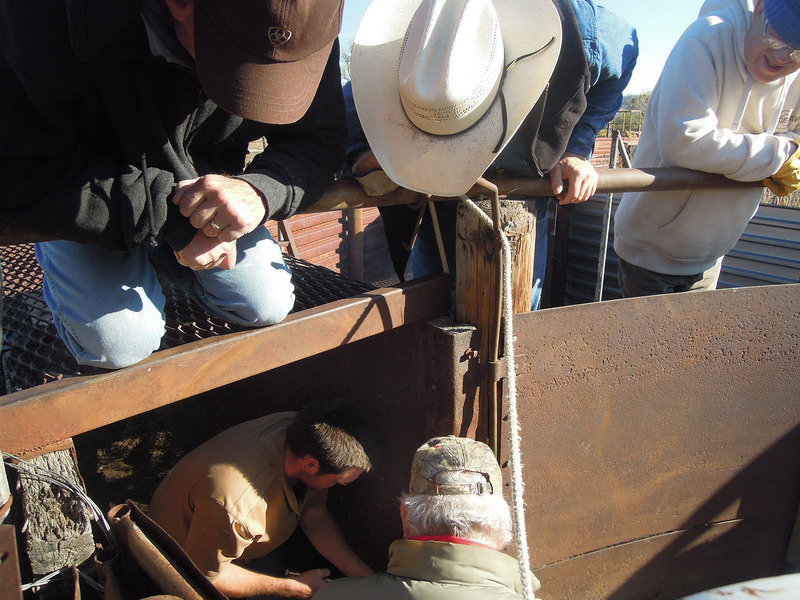 We didn’t know how to help at first, but soon got the hang of closing the heavy iron gates at just the right moment to allow a manageable number of animals to clamor through the corral system at one time. We must have done okay because we were invited back to a second round up. Hundreds of bison were milling around nervously, kicking up dust and being extremely photogenic. though all of the animals eyed me as they made a run for it straight at me. 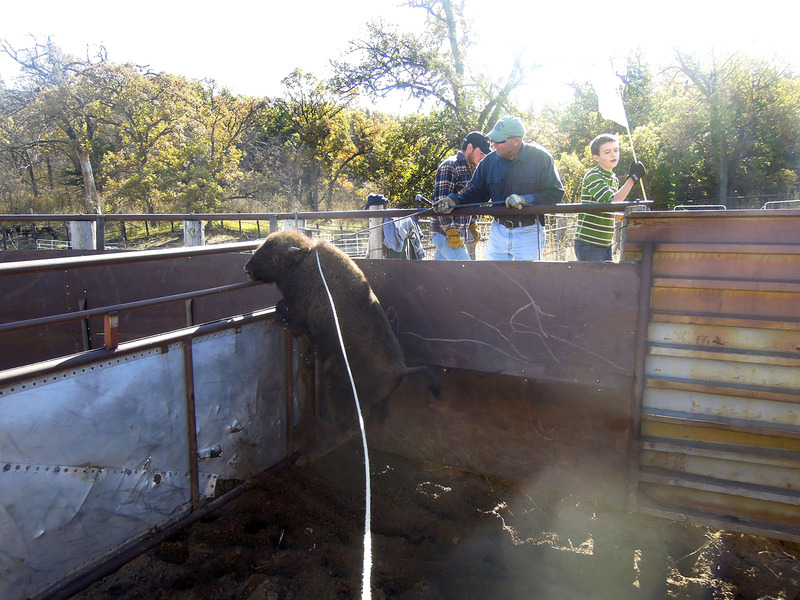 In their haste, the bison ripped out a strip of metal that then cut them as they exited the corral. It took nothing more than some on-site welding, a sledgehammer and teamwork to quickly fix it. Next we drove four hours northeast to visit TNC’s Broken Kettle Grasslands Preserve, Iowa’s largest contiguous prairie, to see how another preserve operates and lend a hand for a few days. Emily Hohman, the preserve’s land steward, showed us around and taught us to winterize fire equipment, which will be important at home after we finish our fall burns. 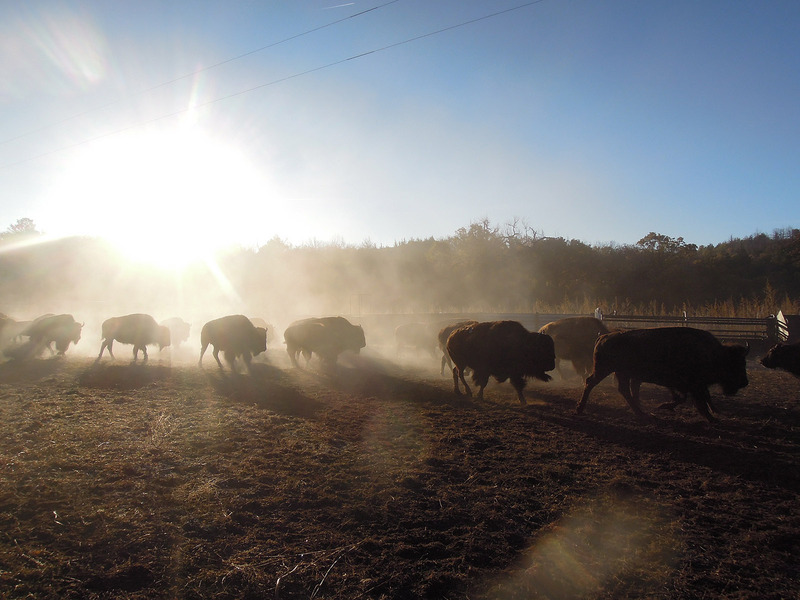 Emily is in charge of stewardship for all of western Iowa, including the management of Broken Kettle’s bison herd. We discussed the challenges of managing large preserves with limited staff in a primarily production-oriented setting, circumstances that we at Platte River Prairies are very familiar with. 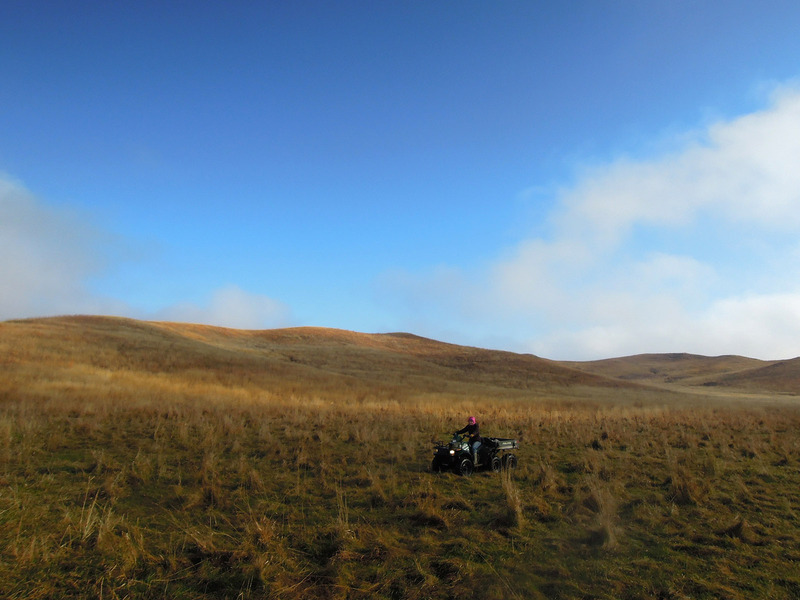 We also got to whip around in the loess hills on six-wheelers while herding cattle. Fortunately, cattle are afraid of people so you can gently steer them where you need them to go by simply blocking their path, which is what Anne is doing in this photo. Sometimes they get confused or feisty and that’s when you have to dash after them to both create distance between you and be where you don’t want them to be. On our way back from Iowa we stopped by the Niobrara Valley Preserve again for a board meeting, this time without seeing any bison. But the next week we were back to round up the west herd for a few more days. We got to use the newer corral system, which has several hydraulically controlled gates for an even safer and more efficient sorting process. Because we had already learned the ropes (no pun intended) at the last roundup, Anne and I were able to jump right in. The evening before the board meeting at the Niobrara Valley Preserve, the staff and trustees met up in the nearby town of Ainsworth for some dinner and socializing, which meant I got to drive through the Nebraska sandhills at sunset. My camera can’t capture how epic this landscape looked at this time of day. It’s nothing like any other place I’ve ever seen. 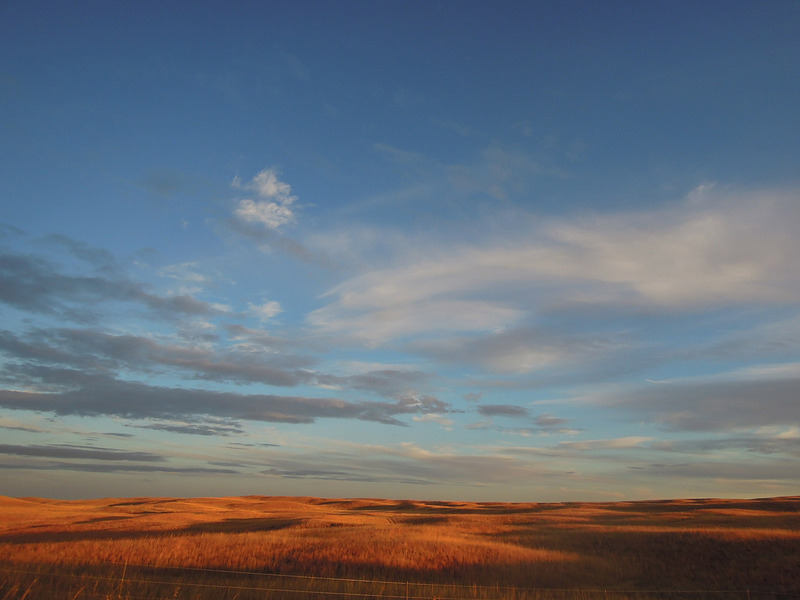 The Nebraska sandhills at sunset. This entry was posted in Prairie Animals, Prairie Management, Prairie Photography and tagged bison, bison roundup, broken kettle grasslands, cattle, cattle herding, eliza perry, emily hohman, fellows, fellowship, great plains, hubbard fellows, hubbard fellowship, iowa, nebraska, niobrara valley preserve, prairie, sandhills by Chris Helzer. Bookmark the permalink. Wonderful photos! The bison were great, but the one I most liked was the one of the sandhills. One branch of my family homesteaded outside Broken Bow in the 1880s. I drove through there in 1959 with friends and have never forgotten the landscape’s look, like a wind-tossed ocean frozen somehow in the form of grass. I enjoyed this post very much. The photos really show what the text describes. They are great. I am from southeast Nebr. but have only traveled through the Sandhills once…at night! Thanks, Eliza. I am glad for you and Anne that you are having this experience in my home State. Best to you both. Thank you for the work that you are doing and learning how to do so that our prairies will still be here for our children’s children and so on. I am surprised you’re not busy burning. If you’re curious … bison sells for $14.99 per pound in my neighborhood. If you guys are getting a fair cut of that price, I expect your operations are doing quite well. Wonderful post! You two Hubbard Fellows are really getting an interesting and diversified experience! If I were in my 20’s, I’d want to apply for the next round! I have really enjoyed posts by the Hubbard Fellows! It is also really great to see the next generation of Land Stewards “learning the ropes”. Eliza- I liked your photo of the sunset in the Sandhills so much that I made it my desktop background. It helps “warm things up” here in ND. You and Anne keep up the good work!